I'm an advocate for jewelry renos, but also advise disposing of pieces you no longer wear. Over the summer, I took my own advice and divested a non-heat-treated sapphire and diamond cocktail ring, ca. '40s. A gift about twenty years ago, it did enjoy some giddy nights on the town. But now, it was no longer me and no one in my family was interested, so it languished in a vault. Below, I was thinking about what to do; notice the ring does not really work with a marinière, let alone a FitBit bracelet! I decided to test the market. Equipped with current appraisal from a highly-respected firm, I met with a prestigious jewelry auction house's appraiser, Mr. P. He admired the ring, then proposed a starting bid at one-sixth the appraised value. My heart sank; there was no way I was letting that ring go for so little. An auction house is essentially interested in a sure sale. A low starting price attracts interest, and though the piece may sell for more, my check of the house's recent sales of large blue sapphires reported hammer prices near starting bids. When I suggested his estimate was low, he questioned the accuracy of the appraisal, until I showed the signature: he had been the original appraiser, in a past job. He wanted me to have the sapphire unmounted and shipped to the GIA for a report (cost, at least $600). I did not find this request unreasonable, since the house has a worldwide clientele, but the very low estimate did not garner my cooperation. Next stop: a carriage-trade antique jeweler who advertises his interest in buying estate fine jewelry. The owner made a wildly lowball offer. Depressed by those meetings, I reconsidered a reno and built a file of ideas, collecting austere examples like the Helène de Taillac design at left. I visited my longtime jeweler, Pam, to discuss the project, but breaking down the ring felt like cutting a silk charmeuse gown into gym shorts. She too thought the auction house's estimate was low, and suggested I show the ring to Ms. M., a gemmologist whom she trusts, for her opinion. That meeting was infused by a palpable frisson: Ms. M. adored the sapphire's velvety, cornflower depths and retro glamour. She asked my permission to take it to a New York gem lab for analysis (at her expense); after confirmation that it was indeed unheated, we negotiated a fair price, significantly more than the auction house's estimate, but a good deal for both parties. 1. Before talking to potential buyers, get an appraisal from a credentialed appraiser who is well-regarded in the industry; if she suggests an accompanying gem lab report (e.g., GIA), have her arrange that. The appraisal value is replacement value, nearly always higher than the target selling price. 2. Research current prices for similar pieces sold by specialist jewelry auction houses (Sotheby's, Doyle, Christie's) and sites like First Dibs, not eBay. If you are selling at an auction outside a major city, and held by a lesser-known house, the price is usually lower. For an important piece, think beyond your local market. The leading auction houses regularly hold client consultations in major cities; contact them to inquire. Before booking an appointment, read the contract to learn exactly how they work and to calculate the net profit you could receive after costs such as commission, handling fees and taxes upon sale. This is not always on their web sites, so call ahead to request those details. You do not want their terms to be news after it's too late. 3. Value is determined by the material, but also by style, workmanship and maker (if signed). My ring's Hollywood Regency swank is hot now; a less-desirable piece that would be broken down for the materials will bring a lower price. 4. Toughen your skin, because you'll encounter buyers who think you are desperate or may denigrate the piece (or your intelligence), as a tactic. On the other hand, realize that sentimental value is relevant to you alone. As in any negotiation, figure out your walk-away price and stick with it. I wasn't facing what auctioneers call "The 3 D's"—death, divorce or debt—so did not feel pressured to sell. 5. If you consign, factor in the consignor's share (which may run as high as 40 or 50 percent) and applicable taxes, and realize that the sale may take time or never happen. Check the consignee's insurance coverage. 6. Remember there are always more options, if you are not in a hurry. I might, for example, have donated the ring to a registered charity's auction and received a receipt to use as a tax credit. 7. Just like selling a house, luck plays its part. Ms. M. happened to love the ring, but what if she had not? Give luck time to show up. If you can, initiate the process before you feel any sense of urgency. Take your time, do your research, and realize what one person says, even if an expert, is only an opinion. I felt a pang letting that opulent jewel go, because that combination of quality and size isn't coming into my life again! But it also felt right; there's a time to find another home for possessions not enjoyed day to day. From cocktails to coffee cup, such is life these days. I love your new ring! It may be an every day ring, but it's so beautiful! I wish a local store carried Ms Rosen's work. 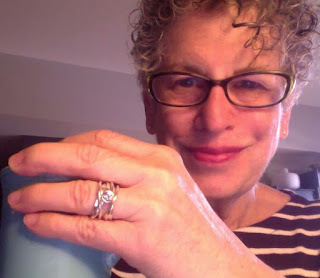 I love everyday rings and have several that I wear, in rotation, almost every day. And your new ring really suits you! I like the new ring very much! It feels quite modern and in sync with your style. My BIL was charged with distributing my late MIL's jewelry, and after the few pieces that were wanted by family had been handed out, went to an estate jewelry broker who explained (to BIL's dismay) that the jewelry styles and settings, while perhaps pricey and desirable in the decade they were purchased, would only sell as "breakdowns" for gold and gems, and so were worth only a fraction of what he'd anticipated. I don't know if he ever sold the pieces or is hanging on in hopes of a different outcome. Great information, the details are so important. Your new ring looks just right. Fascinating to follow your footsteps through this process. Your new ring looks so fresh and lively, a great choice. I believe in passing on things that you don't use or want anymore, sending them off for a new owner to enjoy, whether it's putting stuff by the curb for a free pick up or selling a glamorous ring. I'm not a ring wearer and recently decided to pass on a family diamond ring, which I never wear, to my sister. Perhaps she or one of her daughters will bring it out into the world, much preferable to letting it sit in a box in a drawer. Yes, definitely good to sell the ring if no family member (including DIL) wants it. The new, more casual ring suits your current style better. I'm another non ring-wearer; I always take them off while working and have lost a couple, fortunately none as valuable as your cocktail ring, though they were gold or silver. I certainly admire them on others. I've had "buyers" denigrate antiques I was selling before a move (along with more pedestrian items), one saying "you're only selling your scrap" - while obviously eyeing an antique piece. I love the new ring. So much easier to wear. And of course your expertise and unwillingness to "settle" eases the process of selling old pieces. Love your new ring. The style is more suited to today. Great advise on selling older jewelry. I have some pieces that I have thought about selling, now I know a little more about the process and what I can expect from potential buyers. I live in a small town and getting to any larger town would be expensive. Air fare is the pits in Alaska. Sewing: Not sure where you live but you can always contact the Gallery and deal with them, or directly with Ms Rosen via her web site. If you are in Canada, ordering by mail is easy. Susan: It was bugging me that I never wore that big ring, but even so I am surprised how I don't miss it, especially knowing Ms M. is so happy. une femme: I would not expect a different outcome; however the price of precious metals has risen, so he might realize more from the material now. Should sell and enjoy the proceeds, or use the materials to have something current made. 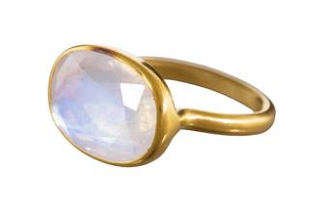 fmcg: I was also very tempted by the Rosen "Footer" rings with no stones. LauraH: My I would have liked to see that ring! Generous, heartfelt gesture. lagatta: There are various gambits buyers, especially pickers, use at estate or garage sales- and one should always feel OK about sending such persons packing! 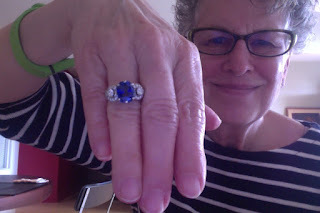 LPC: I was surprised at the gamut of emotion the process unleashed in me, from indignation to depression to resolve... and also happiness that Ms M knew the ring's value and operated from a different value base than the auction house appraiser. Annette: Appraisals can be done by FedExing your pieces to an accredited appraiser. and click on "Appraisers" at the top menu. Your new ring is gorgeous and it has a very fresh look to the design...it's disheartening to think our investment jewels are not worth what we paid for them. I have a sapphire and diamond ring which I wear on occasion but like yours it spends a lot of time hidden away. I am not ready top part with it yet but who knows it's sale might finance another piece of jewelry! hostess: "Investment" is one of the most-abused terms in the jewelery world. Very little of it is genuinely going to yield a return when you sell. (In short, usually only stones of exceptional quality or rarity, signed pieces from renowned houses or pieces with historical provenance will increase in value- despite the "replacement value" on an insurance appraisal.) Jewelers have to break this news to disappointed people all the time. I hope this post encourages you to consider re-setting or selling...like clothes, if it no longer delights (or fits, LOL), time to do something else with it. hostess: I meant to write "very little of it is going to yield a •profit• when you sell. I came back and reread your post and have a new perspective. Your comment that the auction house proposed a starting bid of 1/6 of the appraised value is instructive. Perhaps auctions are the place to buy vintage jewelry I say this having attended a art action last summer (connected with one of my husband's legal cases) and was amazed at the great art going for very reasonable prices. The same as jewelry! There was one piece of art I really wanted, but could not bid due to our connection with the seller. Your new ring is stunning and so so right for your style and lifestyle. Bummed you didn't offer the cocktail ring here; I suspect that someone *cough* might've been willing to match Ms. M's offer +10%. Still, glad it went to an appreciative home and that its parting caused you so few pangs. Yay!